The date of the photograph is unknown, but was taken at Langford Lodge in Crumlin, it's called the Shell House. 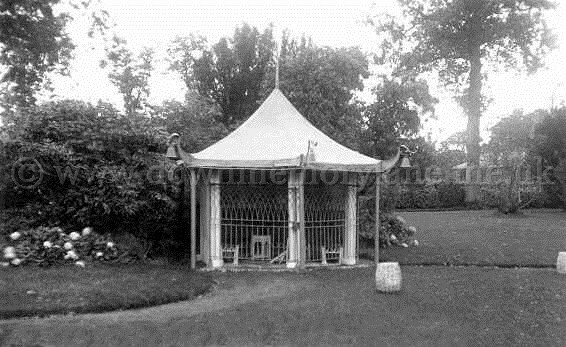 Was it a bandstand? can anyone out there tell me. Are those bells hanging from the corners of the roof? 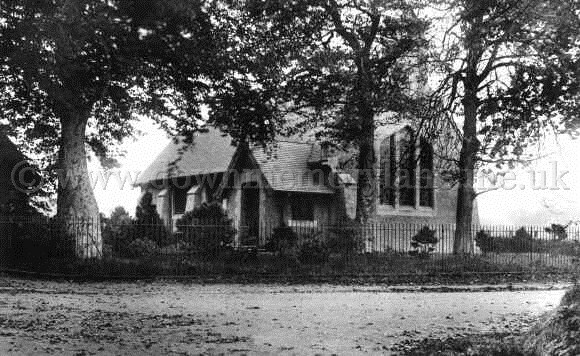 This photograph of St. John's Church in Crumlin was taken in 1910. The card is postmarked Crumlin 6pm July 1912. To: Miss Mabel Walker, Sionfin, Fintona, Co.. Tyrone. Hello wee girlie are you enjoying your holidays? See and do so, for time is flying, am counting the days till you return now. 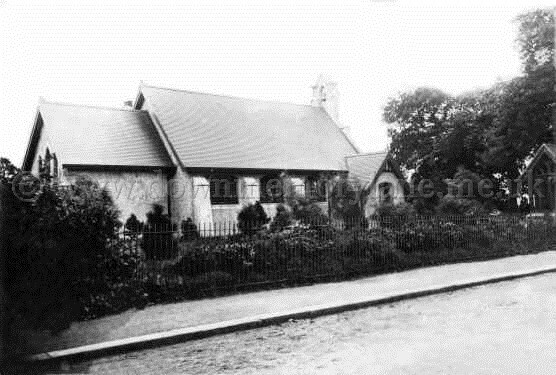 This side view of St.John's Church in Crumlin was taken in 1910. 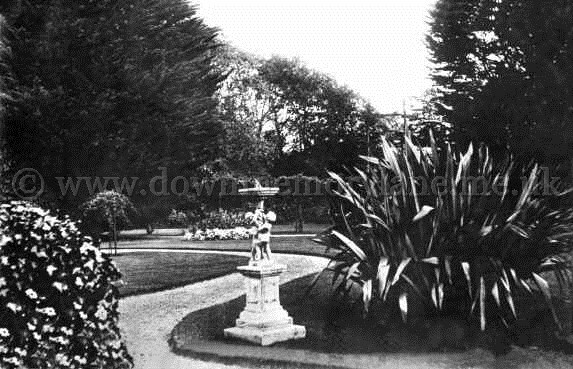 This photograph of the Sun Dial was taken in the grounds of Langford Lodge, Crumlin in 1920. Postmarked Crumlin 5pm 14th July 1922. To: Miss M. Walker, Girl Guide Camp Clough, Co. Down. Dear Mabs, Many thanks for your nice card, glad to hear you are having such a good time. The scouts are coming home today. Here we are at St. Joseph's Primary School and the pupils are all gathered together for their annual school photograph. 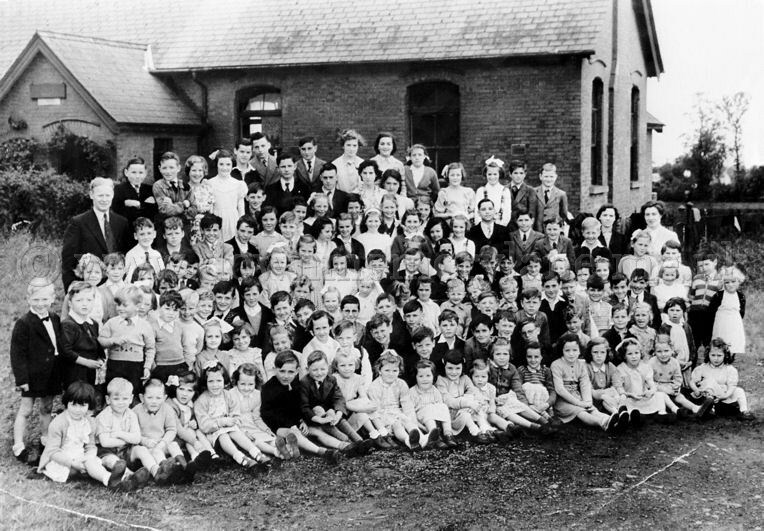 On the left at the back are Mr O'Brian, Gerard Murphy, Billy McIlroy, Unknown, Unknown, Pat Akin, Jimmy Dunne, Unknown, Francis Kelly, Unknown, Miss Donnelly, Ann Barnet, Unknown, Unknown, Uknown, Unknown, Mary Murphy, Bridget Cardwell, Master Donnelly and Master McClaren. 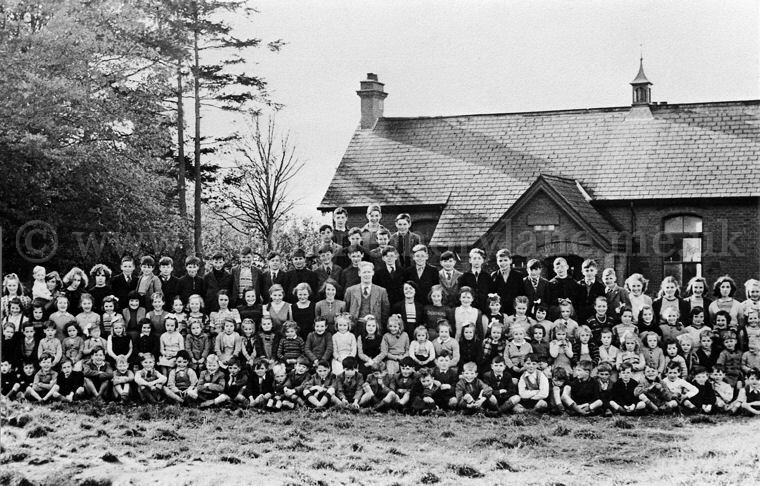 3rd row has John Slane, Paddy bMcGee, Richard Britten, Master Lennon, Unknown, Raymond Cardwell, Unknown, Unknown, Unknown, Unknown, Ann Soley, Moria McGunniess, Unknown, Unknown, Unknown, Unknown, Unknown, Gerald McGuire, Terry McClaren, Miss Corr and Miss Burns. The 1st row has Unknown, Sean Murphy, Jim O'Neill, , Unknown, Unknown, Unknown, Unknown, Unknown, Unknown, Master Mullholand, Master McPeak, Unkonwn, Brian Murphy, Unknown, Unknown, Master Dunne, Unknown, Unknown, Master Henry, Unknown, Unknown, Unknown, Unknown, Unknown, Gabriel Mooney, Unknown, Unknown and Unknown. Then seated we have, Miss Slane,, Unknown, Unknown, Pasty McPeak, Unknown, Hugh Henry, Peter Grant, Liam Lenaghan, Pasty McMahon, Brian Casey, Unknown, Unknown, Unknown, Unknown & Miss Cush. On the ground are, Unknown, Unknown, Unknown, Unknown, Unknown, Unknown, Unknown, Unknown, Unknown, Pat McClaren, Unknown, Brenda, Ann Grant, Unknown, Unknown, Unknown, Unknown, Miss McGee, Briget McGee, Unknown, Unknown and Miss Cush. At the back from the left are Unknown, Unknown, Unknown, Unknown, Unknown, Gerard Murphy, Unknown, Unknown, Unknown, Unknown, Unknown, Unknown, Unknown, Unknown, Unknown, Unknown, Unknown, Unknown, Unknown, Francey Kelly,Unknown, Unknown, Unknown, Unknown, Unknown, Jamie McKee, Master Logue, Billy McIlroy, Chris Hoskinson, Terry McClaren, Unknown, Unknown, Unknown, Unknown and Unknown. The rest of the pupils are all unknown, the headmaster is Mr O'Brian. 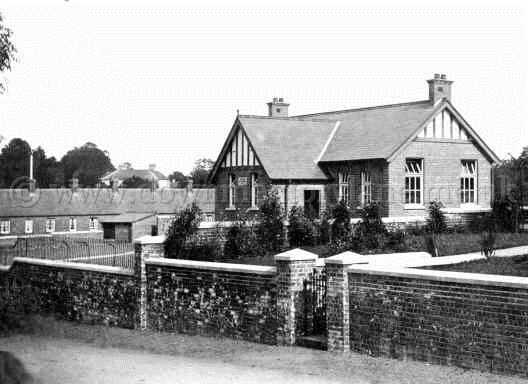 This photograph in Crumlin is of Sunnymount National School. This photograph taken in 1943 during WWII tells you all about it without saying a word about the people in it for it's just oozing out of it LOVE. Emily whose surname was Hanlon and lived in Crumlin worked at Aldergrove Airport which was not far from her home. It was in the canteen that Emily met Jack Stevenson an Aeronautual Engineer from Belfast who came in to have his daily meals and when he saw Emily he fell hopelessly in Love. 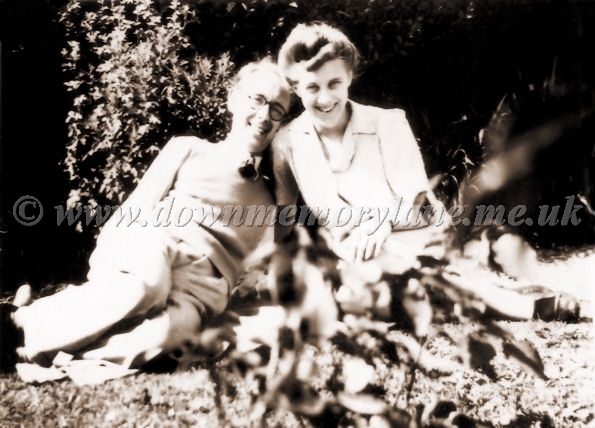 Two years later in 1945 they were married and the smiles never left their faces. Walking past Crumlin Presbyterian Church on Main Street in Crumlin in 1949 is Emily Stevenson nee Hanlon on a return visit to see her family. 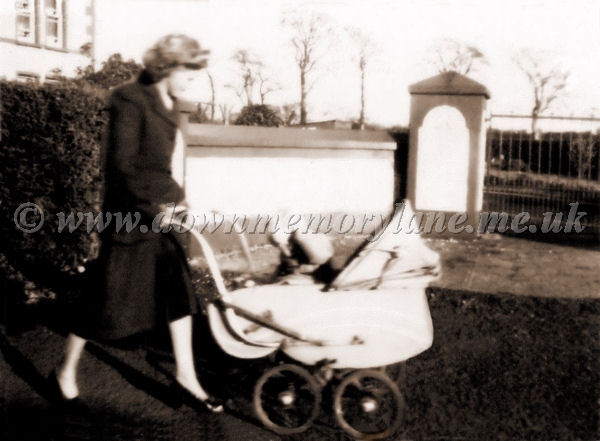 After the WWII Emily and her husband Jack went to live in Croydon England and here in the pram is her second child a boy who they called John Stevenson. 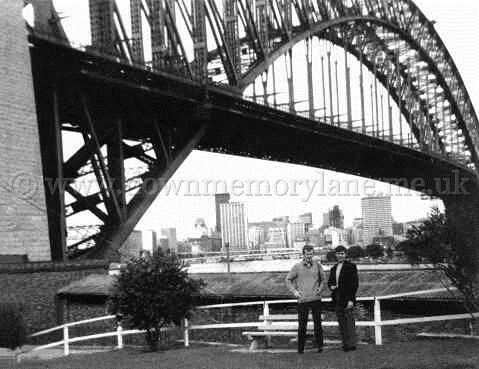 Standing below Sydney Harbour Bridge, Australia in 1966 after immigrating there in 1965 are two Crumlin lads Jim Scott and Hamish Cairns.